In contrast to my meal at The Diner, I’ll keep this review short and sweet. The Diner is trying its hardest to live up to its namesake by being as American diner-style as it possibly can. This includes the booth seating and food served in baskets. Now I’ve never actually been to an American diner, but I was, however, under the impression that American service involves overbearing niceness and smiles, even if it’s accompanied with a healthy dash of fakeness. Combine this mildly hostile zombie with a large group of us sat at two cramped tables that could barely accommodate us and some poor acoustics, and the evening was not looking promising. The food was the ray of hope. Food can make everything all right. Not at The Diner. It isn’t terrible. It is just so distinctly average that I wouldn’t pay for it again. 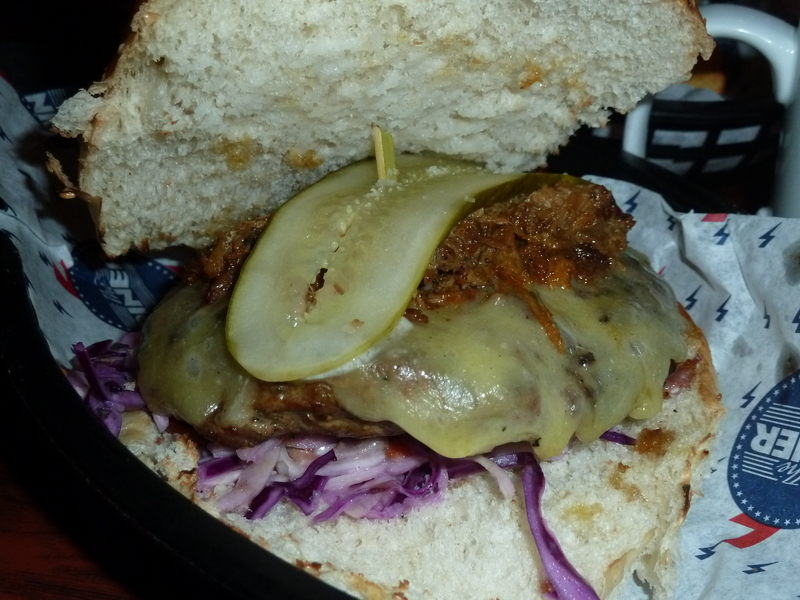 I took the Arch Burger (£8.00), which involves a 6oz hamburger topped with St Louis pulled pork, Monterey Jack, coleslaw and dill pickle. Its appearance is rather aesthetically pleasing. However, it left no lasting impression at all. 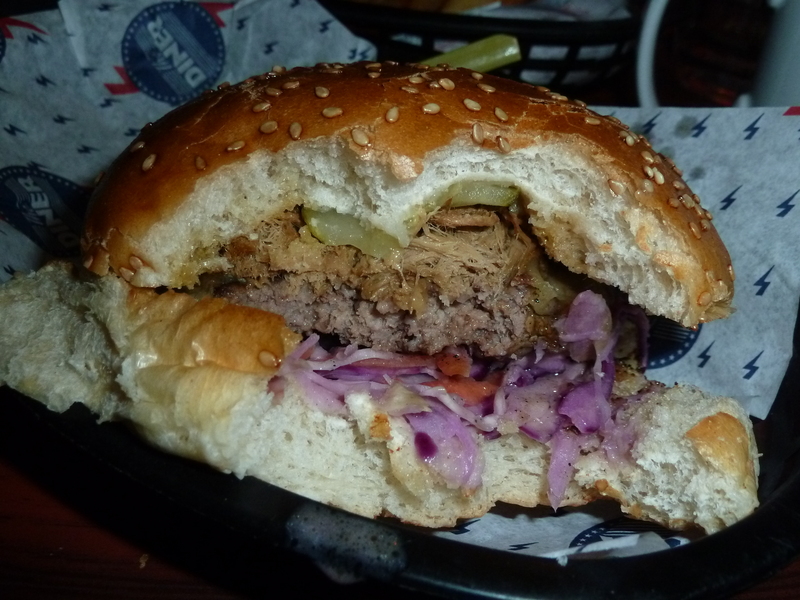 The burger was a little dry – disappointingly not pink in the middle – and the pulled pork contributed nothing to the overall flavour. 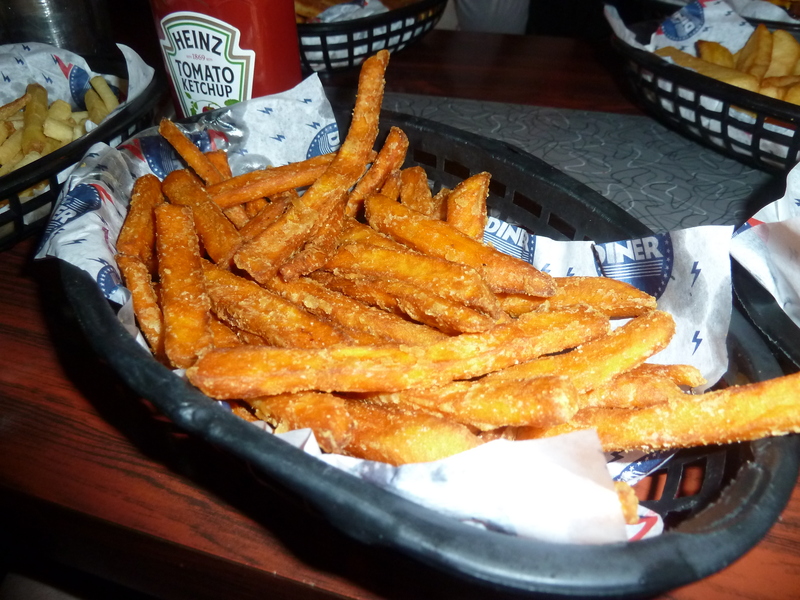 The fat fries (£2.90) and sweet potato fries (£3.30) were perfectly fine, and I also sampled Diner Fries (Cajun Spiced Fat Fries, £3.10), which were a little addictive in their salty spiciness. 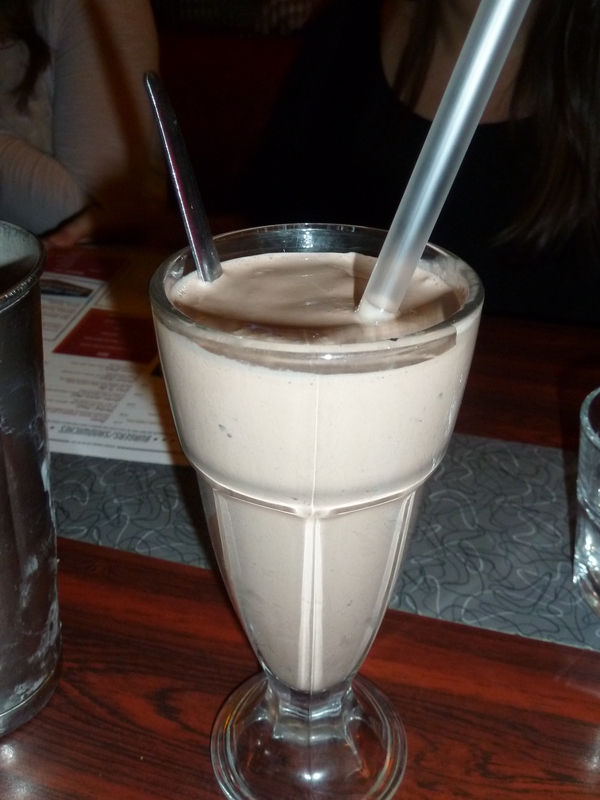 Inspired by the divine milkshake offering from Haché, I ordered a chocolate and pistachio milkshake (£4.70) which was insipid and sickly. To top this all off, we received a bill with an incredibly patronising “Thank you :-)” written on it. This seems to be the latest trend in some restaurants. A little personal message written on the bill. And if the service charge isn’t included, this fact is circled should we fail to notice it. As someone who always pays service, this really, really annoys me. In the case of The Diner, I was left speechless. How was our waitress able to draw a smile yet fail to produce an actual smile on her face?! 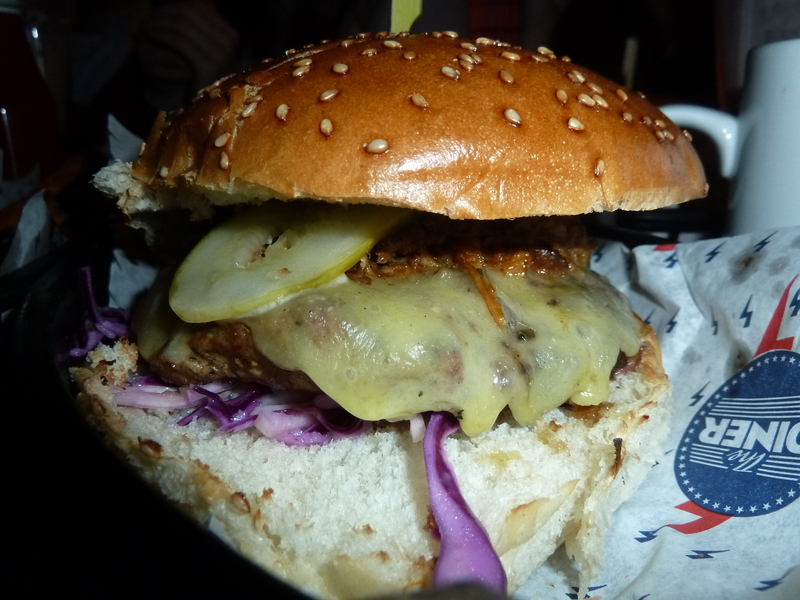 We debated whether to actually pay the service charge, and on reflection, we really shouldn’t have done. As was revealed in these discussions, she’d even forgotten to bring one of our co-diners’ hotdog and they’d had to chase it up. What can save an evening is the company. It was my friend’s leaving party and she had plans. Now that she had fuelled herself on comfort food, it was gaming time. So we all piled off to the arcade in the Trocadero and shot some zombies. Much more satisfying indeed. 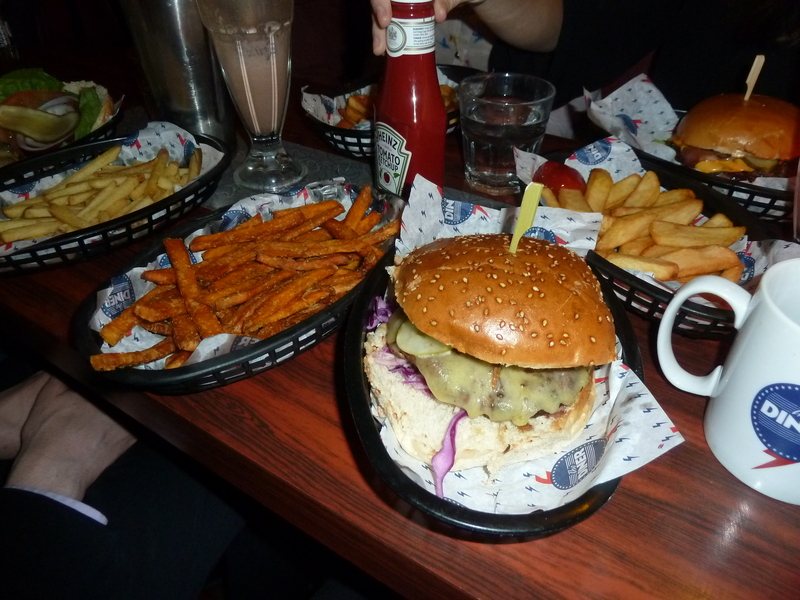 The Diner, Soho 1/5 – Terrible service and mediocre to below average food. Not much comfort from comfort food. When: Seven days a week. Exact times vary depending on the branch.